Zeboyd Games is, in my opinion, the name to beat when it comes to Western indies reinterpreting classic JRPGs. Rather than simply reskin Final Fantasy 4 over and over, Robert Boyd and Bill Stiernberg take mechanics and systems from the whole history of the genre and put a modern, streamlined spin on them. My greatest ambition for Silicon Void was to give them some competition. 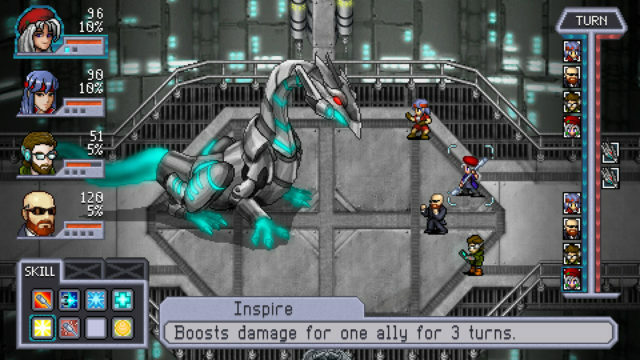 This winter I finally played through Zeboyd’s Cosmic Star Heroine, which I backed on Kickstarter but put off for a long time after its release last spring. Zeboyd takes a very thoughtful approach to combat system design and as CSH is their most inventive game so far, its mechanics merit a close analysis. RPGs have been struggling for decades to make it worthwhile for the player to use status effects. 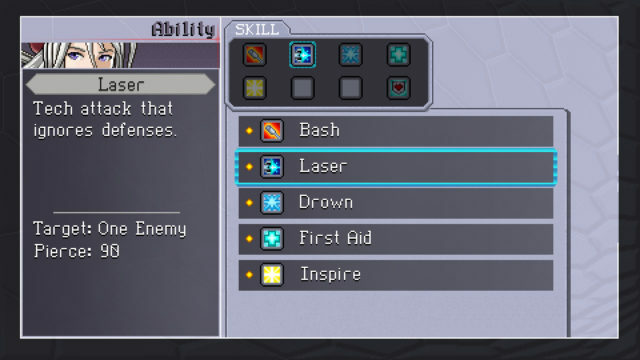 Enemies that use status effects add valuable situational variety to any RPG; for players, it’s often hard to justify spending resources on status-inflicting abilities rather than plain old damage. Either the effect is not powerful enough to justify the cost, or bosses are immune to it, or (my personal least favorite) its hit rate is low and random. Zeboyd tries a novel solution to the problem in CSH. Using status abilities deals damage to a hidden “status HP” bar on the target, and the status is inflicted when the status HP hits zero. Thus, even if the status is not immediately successful, the turn wasn’t necessarily wasted – it was an investment towards eventually inflicting it. Re-inflicting statuses is more difficult as the status HP pool becomes larger each time. I appreciate the care that went into crafting this system, and it succeeds in making statuses an essential part of your toolkit in the early part of the game. Inflicting poison on a boss during turn 1 is a great investment when the battle will last 10 or 12 turns. A particularly nice detail is that Hyper Mode – a damage buff each character gains automatically every few turns – applies to the amount of status damage you deal, so you can be fairly confident of inflicting successfully in one turn if you wait until a hyper turn. By the end of the game, though, I found the utility of statuses had dropped significantly, mainly because the other abilities outpace them. By level 50, you have access to incredible damage-dealing combos that obviate the need for long term strategies in most battles; as Boyd observed in a devblog from 2014, statuses need long battles in order to be meaningful. I didn’t feel the benefits of status infliction justified the opportunity cost of spending multiple turns to inflict when I could otherwise deal thousands of HP in damage with each hit. An exception is the Vulnerable status, which doubles the damage of the next hit the enemy takes, and makes those game-breaking combos even more game-breaking. Additionally, the opacity of the system made it somewhat less appealing once I reached the point where enemies frequently had enough status HP to resist the first attempt. Even knowing that the success of statuses was not random, having to guess whether the next hit would be the one to succeed made them less useful as situational responses. For example, the Disarm status (a one-time 30% penalty to damage) would be worth spending two turns to inflict on a boss that was about to use a high-damage ability, if it were clear it would take exactly two turns. It would be impractical to actually show a dozen different HP bars for every status, but even something like a floaty text showing “55% Poisoned” after the hit would provide the feedback I wanted. The diminishing relevance of status effects as the game progresses in no way means that the experiment was a failure. Making statuses appealing for a substantial part of the game’s difficulty curve is a major achievement. 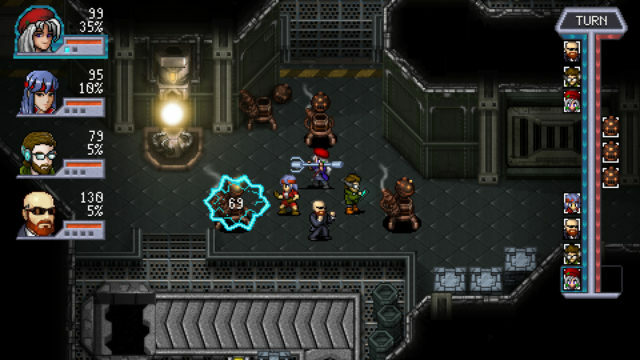 And to some extent, the player’s ability to bypass such mechanics by leveraging “broken” late-game abilities is an aesthetic choice to reward the player who opts for as much optional combat as possible. I think we’ll see continued improvements to this system in future Zeboyd games – and hopefully other RPG designers inspired by their work.